Order books using the form below. 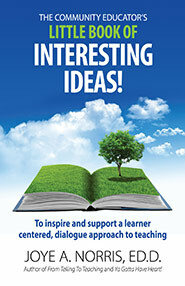 The Community Educator's Little Book of Interesting Ideas! This little book of 32 essays shares with your teaching heart some of the quotes and principles that have had special meaning to thousands of educators over the years. Need some motivation? Spirit lifting? Challenge? The "Little Book..." provides all three. It is appropriate for all educators! 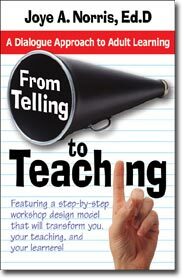 Start shifting from hope to evidence, from delivery to discovery, and from you to them by ordering From Telling to Teaching right away and get started with the exciting work of reinventing your teaching and ratcheting up the results. Did you know that in teaching, everything counts? "Everything" includes your caring behaviors, your attitude, enthusiasm, and energy - and the difference they make to your learners. Dr. Norris takes you through a step by step approach to facilitating for learning, beginning before your learners arrive, continuing through greetings, guidelines, anchoring warm-ups and strong closings. Start your journey today towards powerful facilitation practices that will help you help others enjoy a better life. Select the quantity of each item below along with the desired shipping method. Click on the Review Order button to see the amount including any discounts, and click on the Buy Now button to purchase using a Paypal secure shopping cart. We also accept purchase orders, and offer volume and book store discounts. 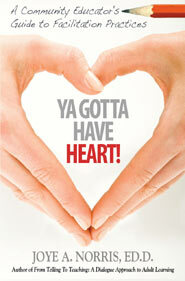 Call 843-281-8832 or e-mail for details. SC residents- 6% sales tax will be added. Online Orders are processed through a secure shopping cart provided by Pay Pal online payment service. PayPal is the world's largest Internet payment network and is recommended as "the most reliable personal payment service". Pay Pal accounts have $0 liability for unauthorized purchases and your financial information isn't shared with retailers. It is securely protected to minimize fraud and help safeguard your identity. More information www.paypal.com.